At around 10:30GMT (4:30am EST), Internet service appears to have been restored in Egypt amid protests in key cities throughout the country, likely tripped by the collapse of the 30-year regime in Tunisia. 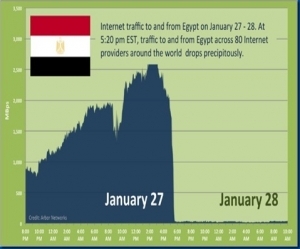 Internet service in the country was originally disrupted by the ruling government after online social networking sites were found have been the platform originally used to organize anti-government riots across Egypt. Mobile phone networks also appear to have been restored after access has been intermittent as the government attempted to restore order through a communications black-out. Popular social networking sites such as Twitter and Facebook may still be blocked though Twitter and Google have collaborated in offering an International telephone number to include updates to Twitter. Twitter has been host to tens of thousands of anti-government 'followers' during civil unrest and is being attributed to helping organize protesters in major cities.